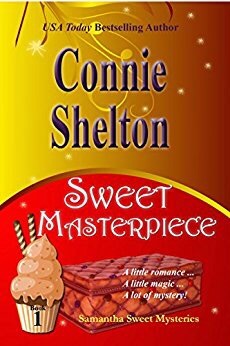 Sweet Masterpiece by Connie Shelton is a cozy little mystery. I downloaded this book for free off of BookBub. As Cozy Mysteries go, it was not bad. It was slow. The romance part felt lacking in actual feeling to me. I did not get into it or feel anything towards the characters. The main character is a baker. She owns her own company and makes cakes and cupcakes. I think that was my favorite part of the book. Her daughter remains a complete mystery. Her story line is definitely missing things and has the potential to be very interesting. The mystery was good in the fact that at the very end when we find out the “who done it”, I was surprised. It was someone that was barely a character in the book at all. Interesting twist. The magic was practically non existent. It is possible that, since this is the first of the series, they were simply introducing a magical artifact. Because other than being able to be more productive, and seeing plant dust, this object did nothing. They did not go into the strange way that it was found. Or it’s origins. No back story at all. And with how it was introduced a back story could have written itself. This was very disappointing to me. It is also the only reason that I will be reading book 2 of the series. Hopefully the magic will actually exist in that one and the romance will be more engaging and the mystery will be more fast paced. I always have high hopes though. I’ll keep you posted. I give this one a 2.5 out of 10.